Damn. I know the pain of that break because I've broken the same bone. I distinctly recall the loud snapping sound. 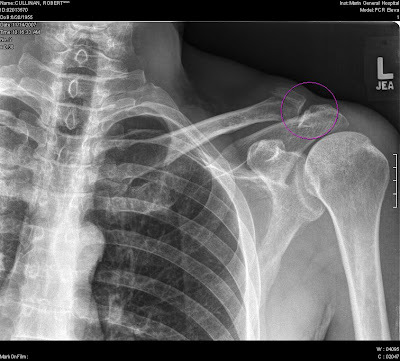 What does it mean that when I broke my collarbone I felt little pain? I crashed badly (my own fault) and walked my bike behind the post office nearby (for some reason I wanted to hide from any police who might appear) and took my mess. bag off of my left shoulder, to a symphony of pops, cracks, and grindings. I thought, "Not a good a sign." So I walked my bike home and when I got there ate the burrito and drank the beer that was in my bag. I couldn't take my pull-over off, though, so the next morning I went to the doctor and had popped my bone right good. Still sore three years later (no mess bags on the left shoulder anymore, and sleeping only on my right shoulder), but the night it happened I felt no pain. None. No a lot of pain when I was recovering, either. Didn't need any painkillers. It's the only bone I've ever broken.